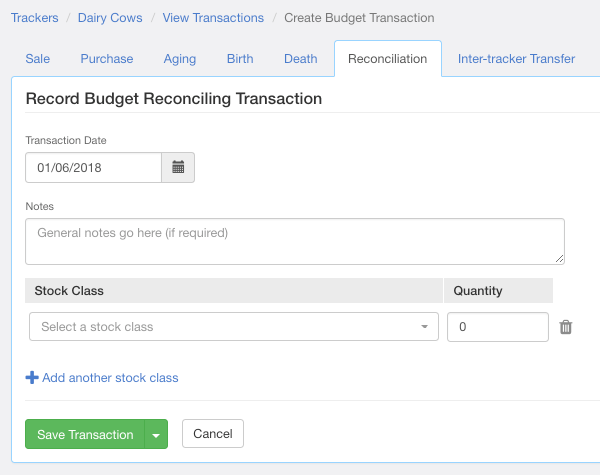 Reconciling transactions can be entered into your livestock tracker from the main screen of the production tracker. A reconciling transfer is an increase or decrease of livestock that does not fall under other livestock movements i.e. last year 50 x 5+ Yr Ewes went missing from the farm and were recorded as a death, and this year 45 x 5+ Yr Ewes walked back onto the farm. That movement would be marked as an increased reconciling transaction. The option to enter a reconciling transaction can be found under Add Transaction, either as an actual, budget, or forecast. To record reconciling, you'll need a date, a stock class, and a quantity. Notes or a description can be added if you wish. NOTE: A reconciling transaction is different from the process of reconciling your trackers with Xero.